Just off the famous Wicklow Way trail – either on the first stage or the last stage (depending on which direction you walk the Way!) 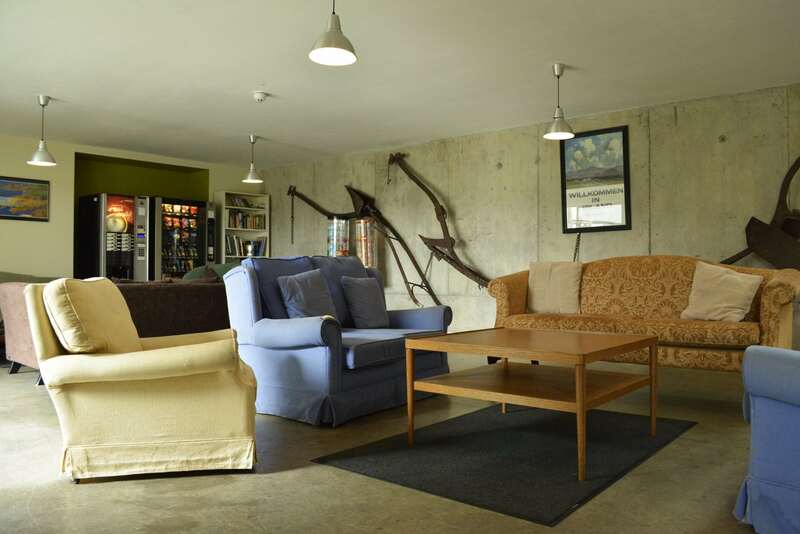 is the rebuilt luxury Knockree Hostel, one of our most popular modern hostels. 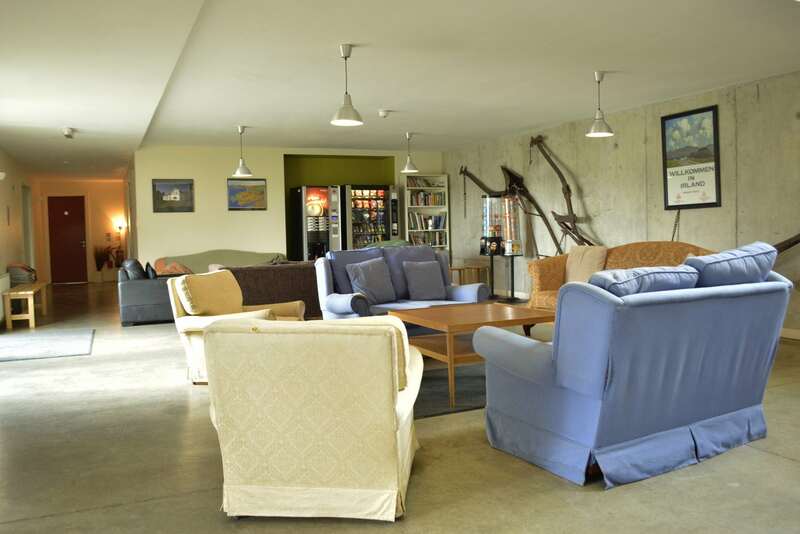 The original Hostel, which opened its doors in 1938 was an 18th century farmhouse, which is incorporated into the rebuild. 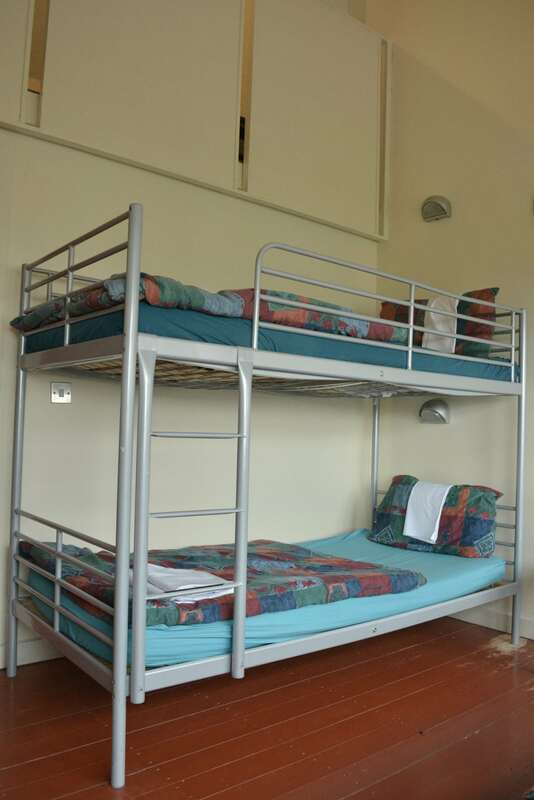 Knockree is a hostel that appeals to many types of travellers and guests. It’s suitable for the individual hiker, couples, families, groups, conferencing and functions. Our ‘Double Deluxe Room’ commands a panoramic view of the fantastic scenery! Knockree Hostel is in a unique location in the Glencree Valley facing Maulin mountain to the south-east and the ‘Sugarloaf’ mountain to the east. 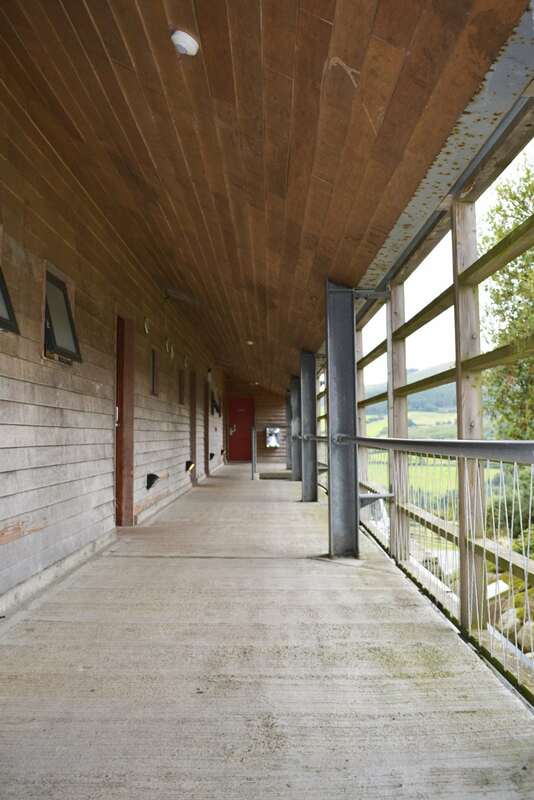 The Wicklow Way passes through the land below the hostel, along the banks of the picturesque Glencree River, and so the hostel is the ideal location for hillwalkers and nature lovers alike. 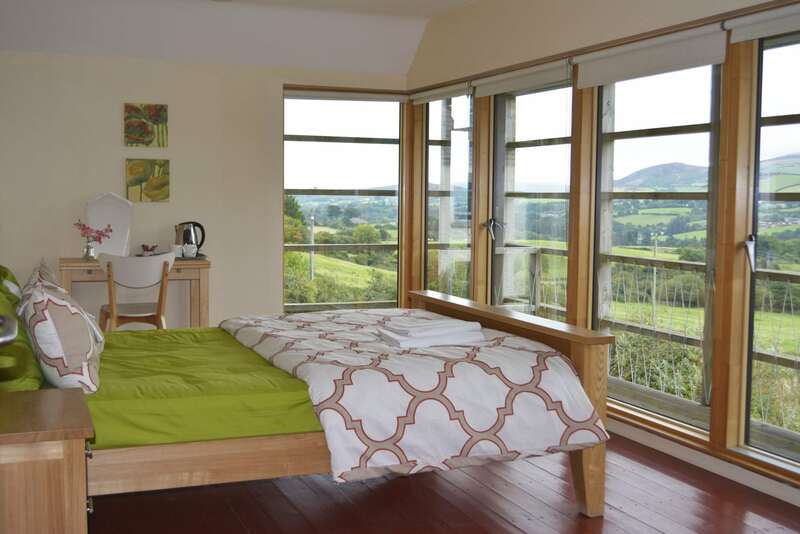 At just over an hour from Dublin, this hostel is popular with Dubliners looking to get away from the city, into the hills and back to nature! 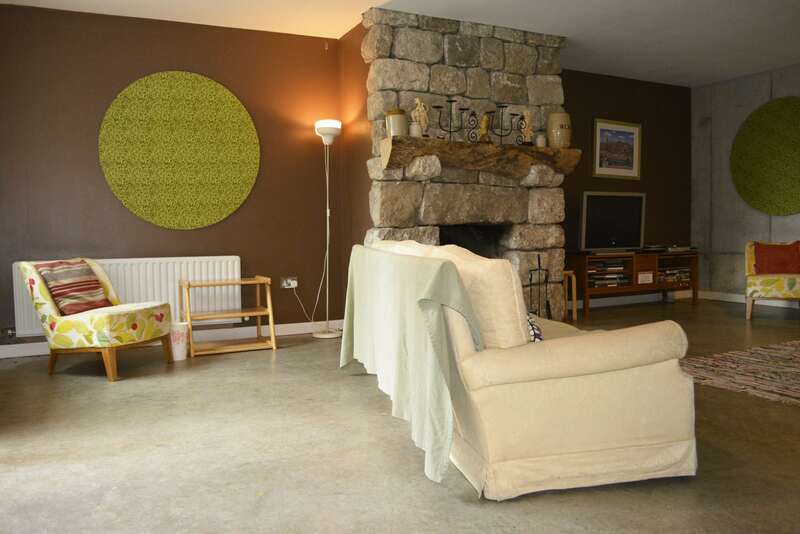 Surprisingly for its proximity to Dublin, it is an ideal rural retreat for those who want to ‘get away from it all’. 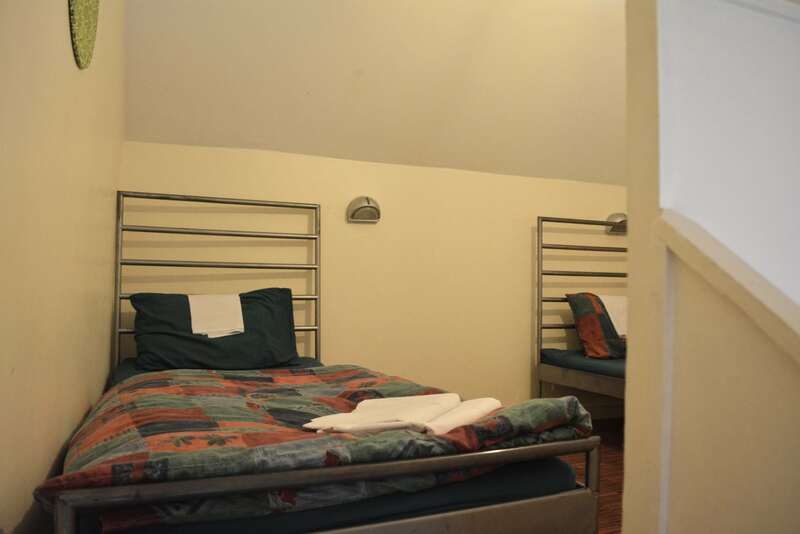 The nearest village is Enniskerry (7.5km) from the hostel. Enniskerry, home to the famous Powerscourt Estate is one of the prettiest Victorian villages in Ireland. 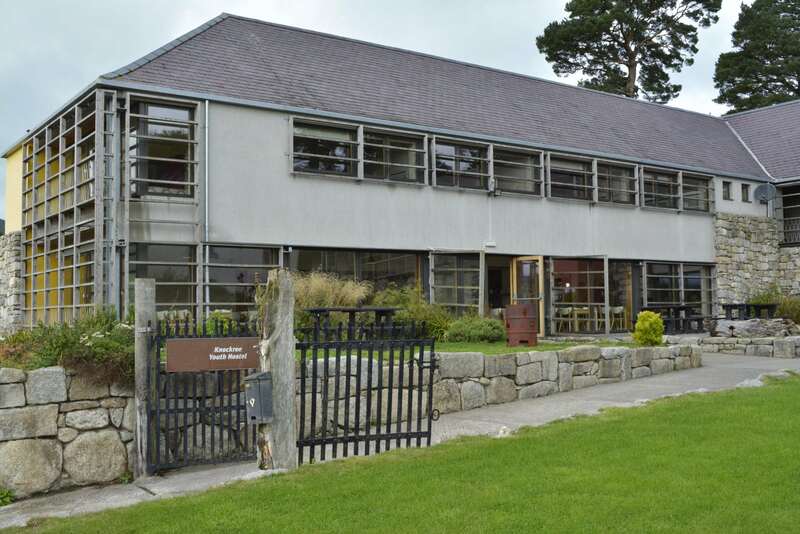 Knockree Hostel boasts varied accommodation, including en-suite rooms, family rooms, wheelchair accessible rooms, dormitory rooms, meeting-room/conferencing area, large-capacity dining-hall, TV-relaxation room with log fire, guest kitchen and restaurant for groups (pre-booked only). We serve a range of breakfasts which can be ordered at check-in. Lunches and Evening meals can be pre-ordered (minimum 4 day’s notice) for 6 or more guests. We have a range of options. Please ask for menus. If you’re short of anything or would like a bite to eat – ask about our “mini-shop” which stocks a supply of foodstuffs and toiletries too! 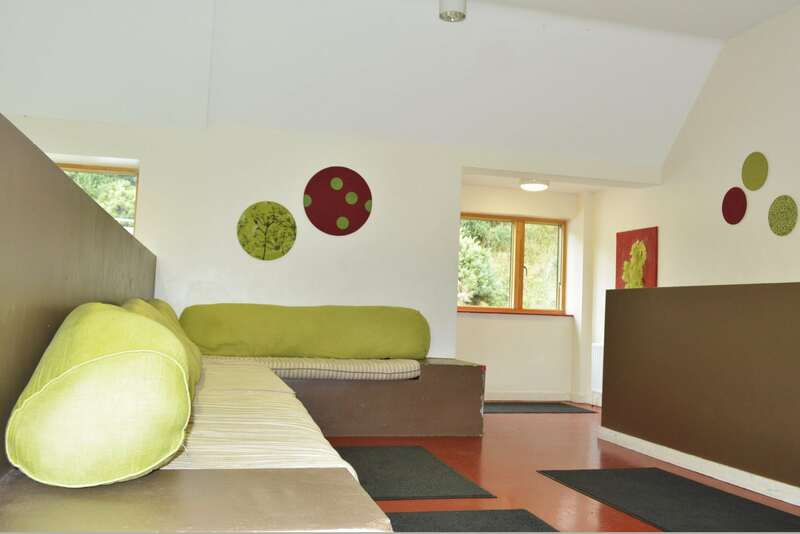 Knockree Hostel is fast becoming one of our most popular hostels with families so be sure to get your booking in early so you can experience the ‘Garden of Ireland’ in one of its best hostels in Wicklow. RECEPTION OPEN: April – October 7:30am – 10:30pm / November – March 8am – 9:30pm – 24-hour keycard access. From Dublin City (North) & Dublin International Hostel : M50 Southbound. M50 Southbound all the way onto N11 Southbound, past Bray North, then take Exit 7 at Bray South, signed for Greystones & Enniskerry. Then follow directions below from Exit 7. From Dublin Port: Alexandra Road out of port then left onto R801 (always heading southbound) over East Wall toll bridge onto East Wall Road (R131) – Stay on R131 along Beach Road in Sandymount until railway crossing, keep left onto Merrion Road (R118) approx 2 miles, until you see turn for N11 signposted to the right. This is Booterstown Avenue at the top of which you turn LEFT for N11 heading southbound (signposted Bray/Wicklow/Wexford) Once on N11 continue until Exit 7 (past Bray North) – Further directions below from Exit 7. From Dublin South City: N11 Southbound then follow below directions from Exit 7. From EXIT 7 onto roundabout and take last exit (right) off the roundabout signposted Dublin and Enniskerry and cross the flyover onto another roundabout then take the last exit down slipway onto N11 Northbound (direction Dublin), stay in slip-lane 100 metres then immediate next left – Exit 6A – onto the ’21-bends’ the R767 – direction Glencree also signposted for Powerscourt – – to Enniskerry village. Take the N11 Northbound (direction Dublin) past 1st exit ramp for Bray (South) turn off left at Exit 6A (before green iron footbridge ) onto the R767 (the ’21 bends’) – to Enniskerry village, also signposted for Powerscourt. From Dublin Road: Northbound turn left onto Old Connaught Ave, (if coming southbound into Bray turn right at junction), then left at Old Conna Village junction with Thorndale Rd (signposted St Gerards School) then sharp right onto Ballymaan Road (signposted Old Dunlaoghaire Golf Club) continue 2,5km then left at T-junction Monastery Cross (OLD Texaco Garage site ) 1km downhill into Enniskerry village. 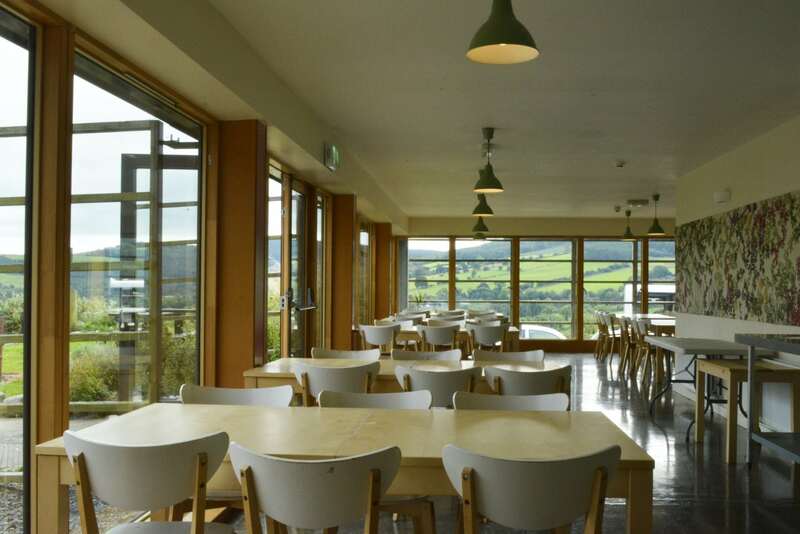 From Enniskerry Village to Hostel – From Enniskerry Village – Take a right fork at the Monument (the Spar Shop will be on your right).Head in the direction of Glencree and travel past the Fruit and Veg shop on the left. Continue uphill 3km /2 miles on Kilgarron Hill through Kilmolin onto Glencree Drive. Continue another 2.5 km (under 2 miles) and you’ll see Brook Cottage Guest House on left, and Cherryhill Farm on right. 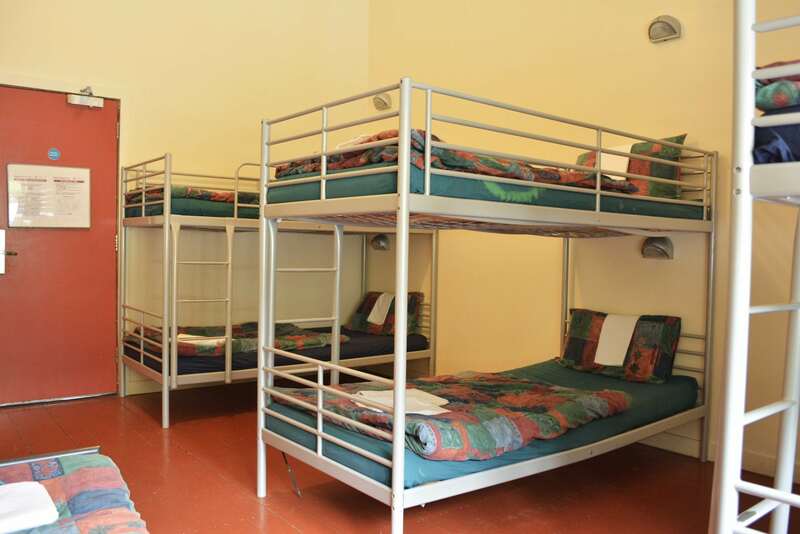 Continue until you see flagpoles on your left and the Hostel on your right-hand side. Take the next Left Turn (It is the only signposted left turn since Enniskerry village) posted for ‘Waterfall’, Oak Lawn B&B’ and ‘Knockree Youth Hostel’. Downhill approx 1km. 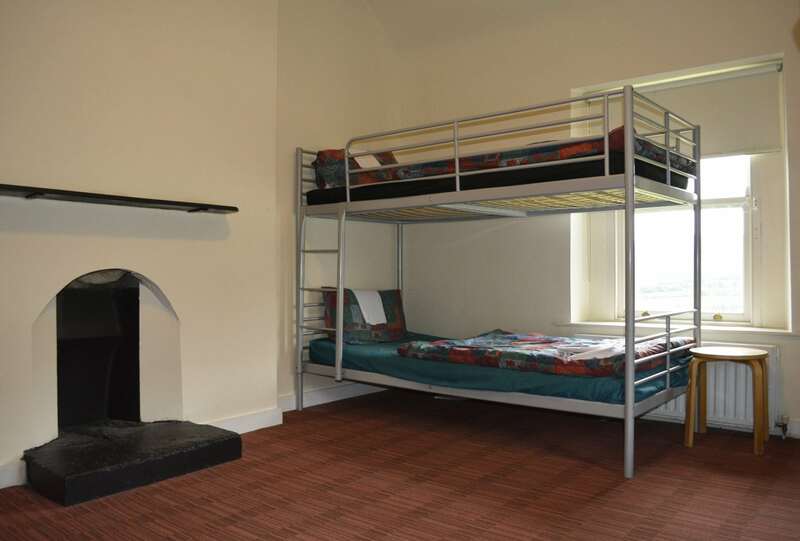 At T-junction facing Old Annacrivey Schoolhouse, you also are facing a blue pole marked ‘Hostel’, and signposted on your right downhill for ‘Oak Lawn B&B’ and ‘Knockree Youth Hostel’. It is a sharp right here downhill, over a little bridge, back uphill past Oak Lawn Guest House on left, a few houses on each side, a new bungalow ‘Finns Meadow’ on left followed by a blind bend to the left at Knockree Cottage with the pillars for Knockbawn House on the right, (the road here becomes very narrow) continue on past Glaskenny Stables & Farm on your left, approx another 1km further you will find the Hostel on the right-hand side. 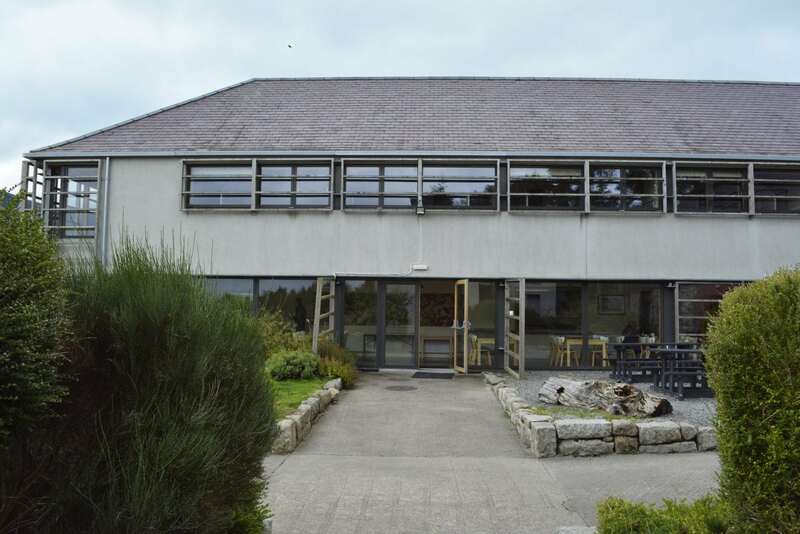 Note the Car Park is BEHIND the building – go past it and take the next entrance. You may not leave cars on the roadside. Do not take the first Left Turn (signposted for the Hostel and Waterfall and Oak Lawn as above). Continue up the Glencree Drive, approx 2.5km further, passing Curtlestown School and Church on right and Curtlestown Woods on right. The ‘Wicklow Way’ travels along this road a short distance from the exit at Curtlestown Woods (on your right) . You are looking for a small left turn. Find Barnamire Lodge and the ‘Community Alert Area’ Sign on left, then there is a small turn left at the Hostel Sign(old-style small brown sign with hostel logo),and ‘wicklow way to Glendalough’ Sign, up a short narrow lane (just wide enough for a coach), high hedges on each side, which widens out at the top. Veer right and continue approx 3 km through the valley on a narrow road until you reach the lay-by/turning-circle at Knockree Hill, which is the Wicklow Way staging point for Knockree. The Wicklow Way is signposted each side of the road. Leave Coach here and continue on foot 200m to Hostel on left . 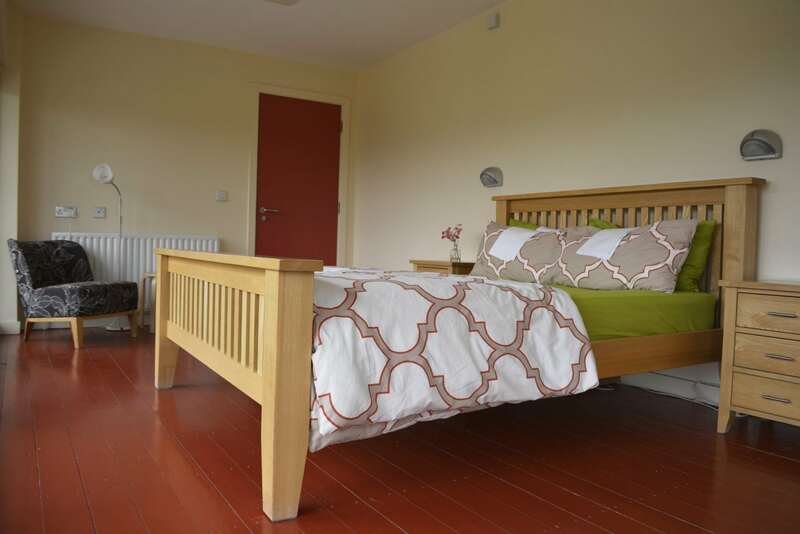 To Bray: nearest large town, 11k from Hostel. From Bray to Hostel: Dublin Bus Route 185 from Bray Station or Bray Main Street to Shop River Terminus (3 k from Hostel) via Enniskerry. Follow directions below on foot from Terminus to Hostel or Taxi from Bray station – Bray Cabs charge €20 to hostel. On foot from Terminus at Shop River to Hostel: takes 30 minutes. The Terminus is merely a bus stop at the side of the road. No shops & no amenities. It is not possible to call a taxi from there. DO NOT DO THIS WALK IN DARKNESS. It is a rural area with no street lighting and very narrow roads. Mobile phone coverage is not available in parts of the area. Stay on the left and walk on past Brook Cottage Guest House on left. Pass Cherryhill Farm House on right and take the next Left Turn posted for ‘Waterfall’, Oak Lawn B&B’ and ‘Knockree Youth Hostel’. Downhill approx 1km. 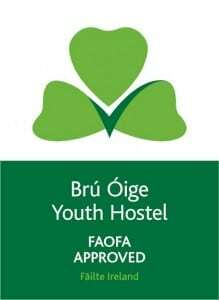 At T-junction you also are facing a blue pole marked ‘Hostel’, and signposted downhill for ‘Oak Lawn B&B’ and ‘Knockree Youth Hostel’. You will go over a little bridge, back uphill past Oak Lawn left, a few houses on each side, a new bungalow ‘Finns Meadow’ on left followed by a blind bend to the left with stone pillars to the right. Pass Glaskenny Stables & Farm on your left, approx another 1km further you will find the Hostel on the right-hand side. Note the Hostel does not provide Dinners/Evening Meals for individual guests, so be sure to stock up and bring food with you. Contact the hostel for advice if you have any questions about food. Our fully-equipped guest kitchen is open 24-hours where guests can prepare their own meals. The nearest shop is 7km from the hostel, and it closes at 7pm, so be sure to purchase your supplies en-route and bring them with you! Lunches and Evening meals can be pre-ordered (minimum 4 day’s notice) for 6 or more guests. We have a range of options. 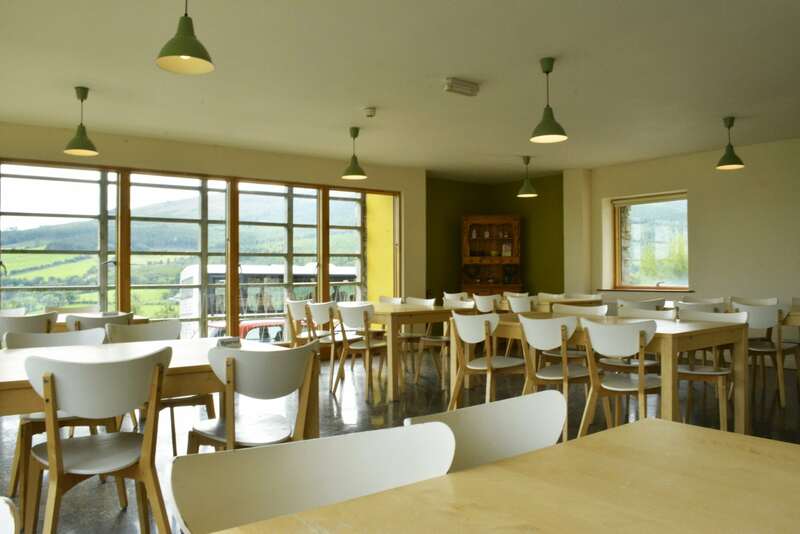 Please ask for menus and contact the Hostel or Head Office to request these.We serve a range of breakfasts which can be ordered at check-in. This consists of juice, cereal, toast, tea/coffee. We can also supply hillwalkers with a packed lunch: please ask at check-in. Mobile Phone coverage is LIMITED (due to location). Only O2 subscribers will receive service within the building.